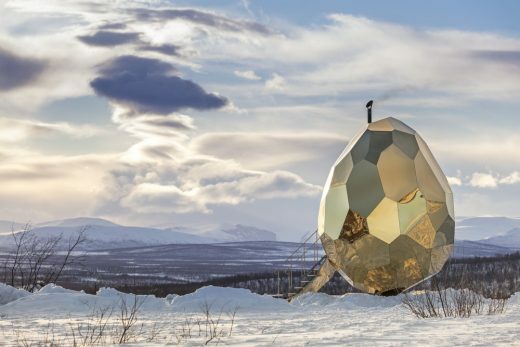 Swedish artist duo creates egg shaped sauna for Riksbyggen and Kiruna. 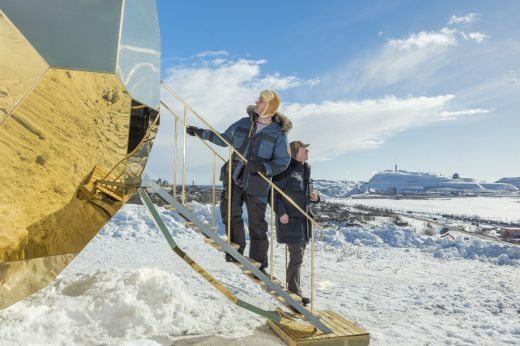 Riksbyggen is commemorating the start of Kiruna’s urban transformation project by opening SOLAR EGG, a public sauna art installation by prizewinning artistic duo Bigert & Bergström, to the city and its inhabitants. 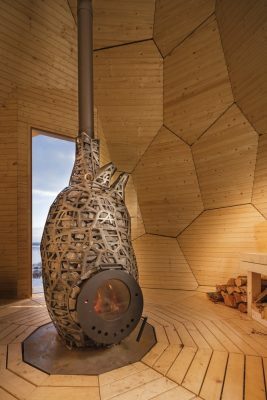 Locals and visitors to Kiruna will this spring be able to enjoy a unique sauna experience in the form of SOLAR EGG, an art installation inspired by the contrasting and dynamic surroundings of Kiruna’s iron ore fields. 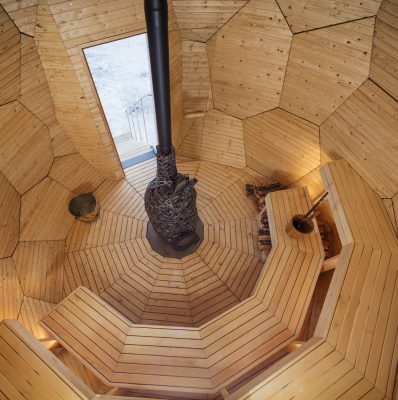 SOLAR EGG is an oval sauna created by the internationally renowned artists Mats Bigert and Lars Bergström. 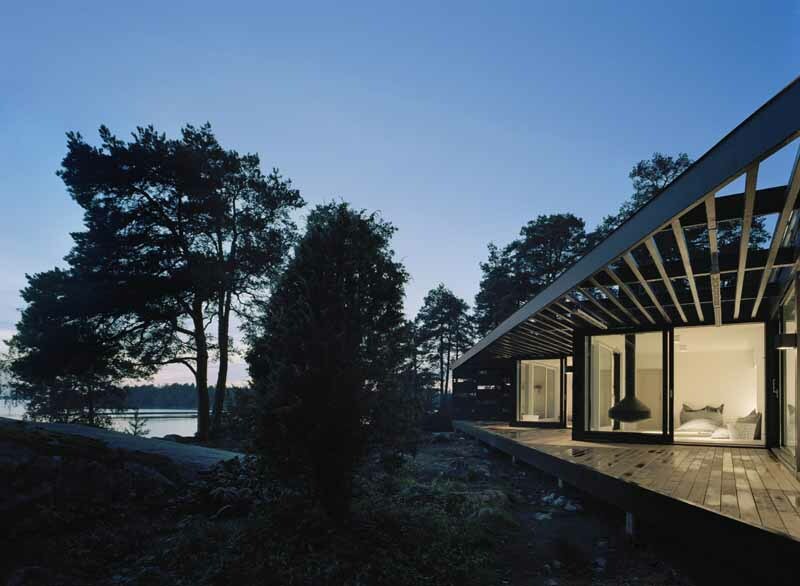 It draws inspiration from Kiruna’s Arctic climate, where light conditions change with the seasons from 24-hour winter darkness to round-the- clock midsummer sun. 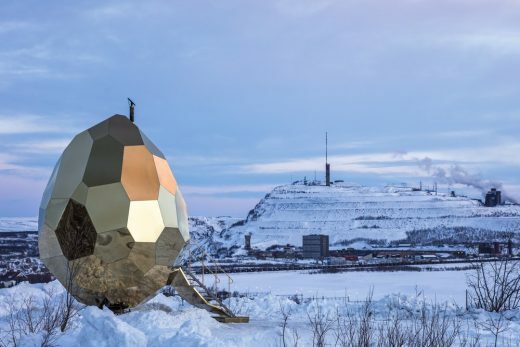 The egg shape seeks to symbolise rebirth and new opportunities at the start of Kiruna’s urban transformation, a project that involves the relocation of entire city districts in response to ground subsidence caused by decades of iron ore mining. 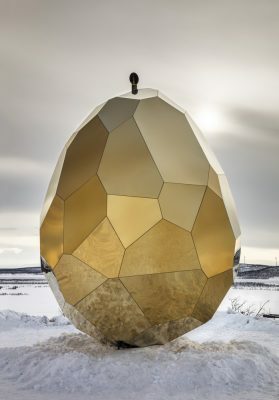 Standing five metres high and four metres wide, the SOLAR EGG has a shell of gold-plated stainless steel that reflects the city and surrounding countryside. Consisting of 69 separate pieces, the installation can be taken down and moved to different locations within the city. 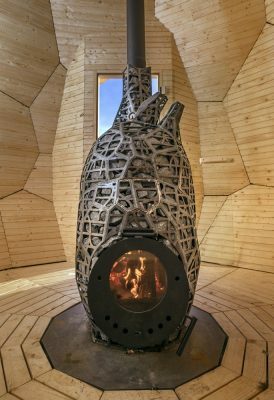 Inside, heat is provided by a heart-shaped wood-fired burner. 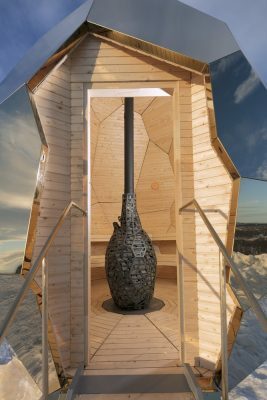 Bigert & Bergström have a longstanding fascination with humanity’s relationship to climate, nature, energy and technology. After gaining international prominence with their climate chamber designed for World Expo in Lisbon in 1998, they have worked across multiple artistic formats – from sculpture and film to performance. 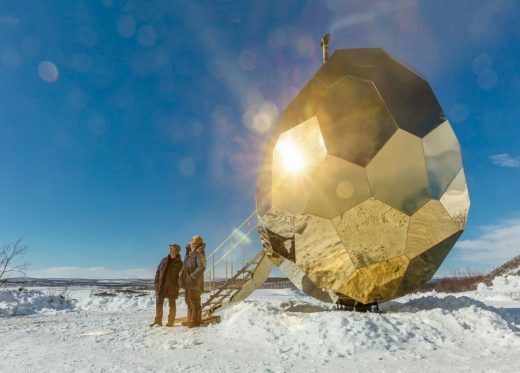 In 2015, Bigert & Bergström covered the peak of Sweden’s highest mountain, Kebnekaise, with an insulating coat to examine whether geo-engineering could help to slow glacial melting. They are currently enjoying considerable exposure in China, where their solo show The Weather War is on show at Shanghai Minsheng Art Museum from March-April 2017. The exhibition explores human attempts to control the planet’s weather and temperature. SOLAR EGG shifts that focus to practical use. Riksbyggen’s residential apartments at Luossabacken will be one of the first construction projects of Kiruna’s city transformation and will have views of the Arctic fells. 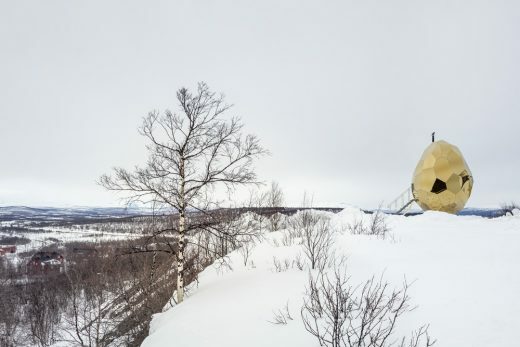 A housing cooperative owned by its members, Riksbyggen wants to give Kiruna a unique natural and cultural experience that reflects the city’s location and puts people at the forefront. Members of the public can book the sauna online at www.riksbyggen.se/solaregg. Riksbyggen will provide changing facilities, towels and other services in cooperation with Camp Ripan. 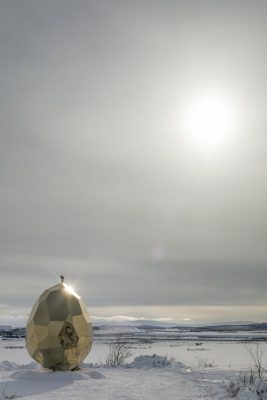 A special international stop is planned at the end of the year – SOLAR EGG will be installed temporarily at the Swedish Institute in Paris, Sweden´s only cultural centre abroad, in collaboration with Swedish Design Moves – a governmental initiative to promote Swedish design, architecture and fashion internationally. Riksbyggen and the mining company LKAB have signed an agreement for the construction of 250 new tenant-owner apartments in the area over the course of 10 years. The first will be Brf Fjällvyn, a development of 47 apartments at the base of the Luossavaara ski slope. Construction is scheduled to start in autumn 2017, with completion during the first half of 2019.